Squalane, a saturated and stable hydrocarbon found naturally in the skin, is an exceptional hydrator that can prevent the ongoing loss of hydration that can impair suppleness. Suitable for all skin types, this softens and smooths dry skin and can even be applied to hair to provide natural heat protection and add shine. Found naturally in the skin, squalane is a stable, saturated hydrocarbon that provides heroic hydration and prevents the ongoing loss of moisture that can compromise skin’s suppleness. 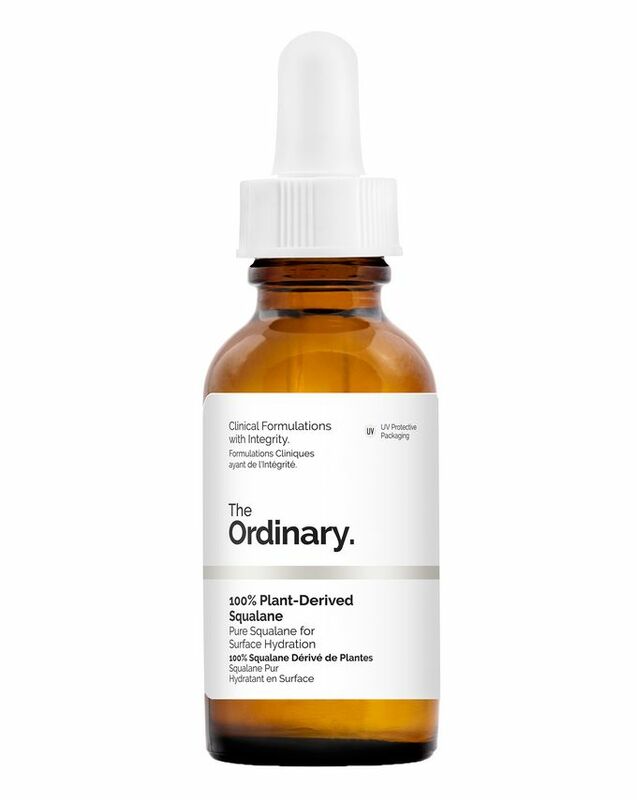 To give skin a super-charged boost of this natural wonder, The Ordinary’s 100% Plant-Derived Squalane softens and smooths even the driest complexions – it’s suitable for all skin types. As an added bonus, drops can be applied to hair to offer heat protection, enhance shine and reduce breakage. Squalene oil is now my holy grail! I have cracked, dry, sensitive skin and this just fixes it every single day! Amazing! Use this for extremely dry skin and it absolutely works wonders! it’s so great as or under a moisturiser. It makes my skin very soft and smooth and it feels so hydrating, without being too ‘oily’. Love that it’s 100% plant derived too. Would definitely recommend! I worry about the ingredients in moisturisers being comedogenic, so rather than using them any more I just use squalane for the moisture element. It doesn't oxidise like other oils, so it won't damage your skin as it sits on it, and it's closely related to your own secretions. So far I'm on my 3rd bottle and I have another waiting. Can't believe the changes in my skin since using this and other TO products. I have been using this oil for the past year and couldn't do without it. I use twice a week at night, and wake up with the softest skin (works especially well around neck, décolletage and on dry patches like elbows). Also find that this works great on my male friends' faces, especially those with beards who want 'softer' stubble. As always, The Ordinary is unbeatable on price, so if you want to try any of their products, this one is a no-brainer. I have been using this for a month, combined in my skincare routine and my face feels so hydrated and supple. I have also introduced my husband to it, he has extremely dry skin, and this works wonders on him. Leaves his face feeling soft and doesn't need to apply cream every few hours. He loves it more than i do! I purchased this as I had a flare up on my face, anything I used irritated my skin. This seemed to calm my skin and perfectly and hydrate my skin. I reacted badly to this product, a minute after applying the squalane my skin felt like it was on fire and I had to wash it off. It's the only The Ordinary product I've tried that has done this. I wanted to try a new moisturiser and thought that maybe this would be okay. But for me this didn't work that well. I have normal/oily and acne prone skin, so I don't need any heavy moisturisers and this was to heavy. It didn't sink in to my skin almost at all. I could wait for 3 hours and it would still be sitting on top on my skin like an oil. I am not a fan of the oil "feeling" it gave on my skin. It literally felt like I had put olive oil all over my skin. I did however like to mix it in with my foundation, but it also made my foundation unable to kind of "set" so I had to put a lot of powder over and that kind of destroyed some of the purpose. All in all I think that the product did what it claimed to do, just not for people with normal/oily skin or people who don't like the feeling of oils on their face. I love this for my PM routine to put the moisture back into my face after stripping off all the grime and dirt of the day! A little goes a long way so I don't use more than 5 drops at a time - excess can be applied to the neck! Soft glowy skin in the morning! In the winter this is fine as an AM moisturizer but definitely not in summer. I have combo skin and I would look like a disco ball. Most oils cause me to break out – this doesn’t. I work in a cold environment, so I use it when my skin is very dry and needs extra hydration; which means most of the time. However, lately, I have been loving using it with my foundation! Leaves my skin looking smooth and moisturized. It’s magical. I put this on before I go to bed and wake up with the most beautiful soft skin. You only need a tiny bit as well. I was very disappointed by this product because I love Buffet so much! My skin is fairly dry on my cheeks because of rosacea so in theory, this should have been a perfect solution. Unfortunately, the serum (it's extremely oily) just sat on top of my skin without penetrating and hydrating at all. Takes about 20 mins to sink into the skin. I apply this at night and wake up to moisturized skin. Doesn’t cause breakouts on my acne prone skin. A very soothing and calming product, not greasy, which I loved using for the last past 3 months. Especially during the night, after the cleaning routine gives to the face a calming and nourished sensation which I have absolutely loved. This oil is so fast absorbing on your face & lips. I have a dry combination skin and this product doesn’t clog my skin. I’ve been using it for a few months now, few drops every day and night, and just finished my bottle. It is a great price-value, would definitely recommend it above other hydrating oils. This feels hydrating, skin is soft after use. I have oily skin but it didn't break me out, although it's very oily, so better for use at night as one looks quite greasy when this is applied. I tried this after reading reviews. It is a great hydrating product and I have very dry skin. That said I only use it at night under a small amount of moisturiser as it is quite greasy initially. My skin feels very soft and smooth in the morning and I will continue to use it. Definitely, recommend! After trying countless moisturisers that didn't hydrate my dry skin enough and often were too greasy to wear under makeup, I decided to give an oil-esque product a try for my dry skin, knowing it was only going to get worse as winter was approaching. This product is perfect for doing exactly that - it hydrates without providing that greasy residue feeling, sinks into the skin beautifully, and works perfectly under makeup to give a fresh, dewy, lit-from-within glow. For me, it really helps with makeup application, as it improves my base so I'm not stacking up layers of product trying to get it to stick to dry skin like I used to. It is a tiny bit tacky but not enough to prolong makeup wear and I do mostly use a primer on top of it, however I have found that makeup doesn't slip off without that barrier, so it's perfectly fine to skip that step if you don't need your makeup to last a long time. I have extremely sensitive skin and have had no issues at all when using this. Not a single spot, no tingling or stinging, no redness - nothing. I recently started using this in my hair too - just running it through my hair when wet and then blowdrying. I was a little worried at first because you know, it's like an oil, and I didn't want to look like I'd just dipped my head in the fryer at McDonalds. Needless to say, it didn't look like that at all; it made my hair SO shiny, silky and hydrated that I was getting compliments all day. I destroyed my hair doing the no poo method and after messing up the pH, it is sooo dry that most masks won't even touch it, but The Ordinary's Squalane is a miracle worker. My hair is down to my bum so I can't afford to use it every time I wash my hair but I use it without fail whenever I want to impress! I use this 2-3 times a day on my face though and I've gotten through a single bottle in 3 months, so personally, I think the value is great as it's really low priced. I've repurchased already but I'll keep buying it again and again as I can't see myself living without this now! This gives good surface hydration and is the only oil I feel comfortable using nightly on my super-oily, acne-prone skin. I mix with a moisturiser or pat this into my forehead and cheeks and layer moisturiser over the top. However, this does not absorb fully into my skin, so if you have oily skin you will likely not be able to use this for daytime use. This product is without a doubt the most amazing moisturizing serum I have ever tried! absorbs very very quickly and leaves my skin feeling really soft and hydrated. I didn’t see much of a difference when I would put it. A bit disappointed, they have much better products. I have very dry, sensitive, spot prone skin. Since having my child and breastfeeding, my skin has just been awful and no hydrating creams have even given an ounce of hydration to my skin. Well Skin, meet Squalane. Squalane meet skin! This stuff is gold! I have never in 27 years, loved a product and STUCK with a product because my skin always rejects it after around 6 weeks. Well, I'm still using it! Dryness has improved ten fold, redness from dryness has subsided, my skin isn't flaking and even my partner said "why is your skin so silky soft". I used it morning and night around 5 drops before Aveno moisturiser. I want shares in it! Have just ordered my 2nd bottle. This little bottle is a bottle of lush, I apply it after all off my treatments am and pm and saw in 3 wks that my skin felt more hydrated. Initially I was told not to bother with squalane as it is not highly rated in the trade!!! Well I have just turned 61 yrs old and I highly disagree. BUY THIS, you have nothing to lose only a softer more hydrated face. Remember looking after ourselves takes commitment! Dry, Sensitive skin, easily breaks out. I was hesitant to buy this one because all the time I use moisturiser even the expensive ones, I’ll have a break out. :( I have flaky skin because I’m too afraid to use moisturiser. But this one, I can’t explain how much my skin loves this one. The morning after I use this, my skin felt so smooth. The first week, I only used it at night but now, I use it in the morning too because I love how my skin feels. I want to touch it always! :D The best moisturiser for me! Will definitely buy more. I love how it remains on your skin all day. Some might say it's oily but that's kind of the point in my opinion. I love this squalane. A lot of high end moisturisers contain squalane because of its brilliant moisturisation factors. I use this at night to water down my retinol so that I can build my resistance up. I add in Marula oil & Rosehip I seriously look so greasy when I go to bed , but once I put a night cream over the oils it seems to keep the oils in place & I wake up in the morning with plump glowing skin, it is fabulous for your hair too, I often go to bed with my hair in a conditioning pack , but cover my hair with coconut oil & some squalane, argon & marula oil, when you wash it out in the morning your hair is so shiny. My friend, who I consider to be beauty expert, recommended this product and I absolutely love it! I've recently turned 37 and I feel like the moisturising effect of this has helped turn back the clock to my early 30s. I do find it quite oily so I apply it at night and I wake up with glorious skin! Takes quite a while to sink into skin, I just put it on around an hour before bed and my skin is super hydrated in the morning. I personally couldn't use it in my morning routine because it made me look far too shiny, but it's fantastic for using at night. Had made my dry skin far better overall. Guess I shouldn't be too critical given the price, but this is very oily indeed. I have quite dry skin and, even at the end of the day, it still hasn't soaked in if I apply in the morning. I use this product every morning and evening, it doesn't cause my sensitive skin to break out at all. I have really noticed a difference in my skin using The Ordinary products - a lot of people have complained about how long it sits on the skin for, but if you apply this under your foundation/BB cream/whatever in the morning it works as the most perfect primer... I have never received so many compliments on my makeup/skin when using this underneath so the lingering has its perks. I have tried loads and loads of different products to sort out my super dry, sensitive and acne-prone skin. This has been the first product that not only gives my skin lasting moisture but also seems to prevent break outs. I love this product and have bought extras in case it sells out and I need it! I've just finished my second bottle of squalane and it's amazing. Wear at night alone or over moisturiser and wake up to perfect skin. Much better results than high-end brands. Just about to order my 3rd bottle. I have combination skin and this product is perfect. I use two drops mixed with my moisturizer during the day and sometimes apply three drops directly at night or when my skin needs more hydration. It absorbs so quickly and doesn't leave the skin feeling greasy and makes your skin glow all day for lasting moisture. I would definitely choose this over the other oils the ordinary has to offer. From the first moment I put this on my face, I knew it was a keeper. I slather my dry skin with moisturisers but usually wake up with either dry skin, again, or a nasty over oily feeling. Not with this. I put it on after Retin-A and in the morning my face is literally PETAL soft. Love. I don't see myself using this product ever guy since it dried my skin out which is the opposite of what it claims to do and broke me out all over. I'm acne prone with normal to oily skin and this clogged my pores so badly even though it allegedly is proven to be non-comedogenic. It's not a bad product whatsoever, but I couldn't see how it differs from other oils that i use. I have the argan oil from this brand as well and these two products do the exact same job for my skin. I mean, this one does the job of hydrating your skin, but if you already own an oil, you definitely don't need both. I used this after my serum (buffet) and felt that it was super oily on my skin, it stays on my face the whole night and had only soaked in after about an hour after waking. After cleansing my skin was lovely and soft so I think that I only need to use this once every few days as an overnight treatment. It did, however, work wonders on my daughter's eczema, her skin looked 10 times better in the morning after using just once! I really like this product. I have an intense combination skin. Oily T-zone and then extremely sensitive around the mouth, I started a new facial regime about a month ago and this was a part of it. Since then my irritation had been gone. Will probably repurchase. This oil leaves my very dry and sensitive skin hydrated and dewy looking. I love that it's 100% plant-derived, that's very important to me. It's simply amazing stuff! For my hair as well. Love to mix the squalane with any of my other natural oils (rosehip, avocado, jojoba, tamanu, argan, seabuckthorn). The only one I use twice a day is the squalane because it's that soft and hydrating and it absorbs into the skin well.